Build posterior muscles, burn calories, and improve stabilization and balance with these single leg exercises. Complete one set of sumo squats directly followed by a set of crossback lunges with minimal recovery. Focus on form, make sure that your knees don’t go over your toes during your sumo squats. During your crossback lunge keep your tailbone underneath your hips and really squeeze your glutes. To position yourself correctly, put your toe on the bench, then bring your opposite foot far enough in front of you so your knee won’t extend over your toe when you go into the squat. 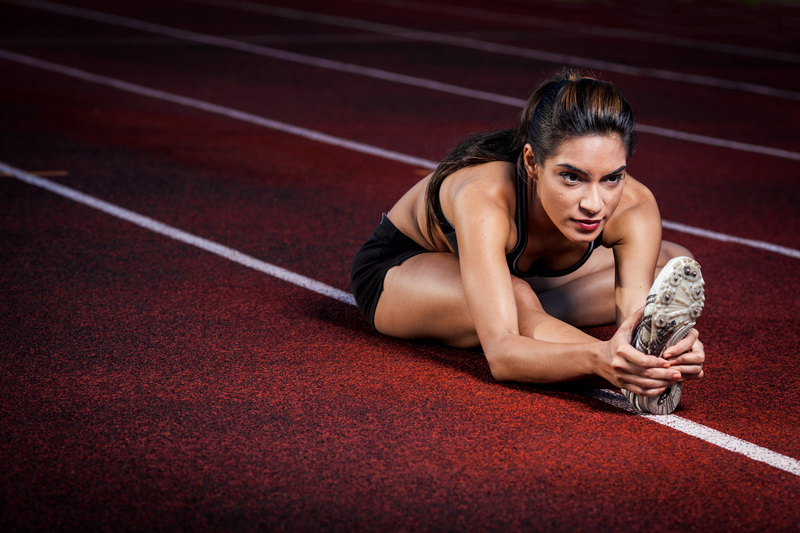 Dig through your heel as opposed to pushing off the forefront of your feet. Keep your balance by engaging your core and keep your hips square. On all fours situate your hands so they’re under your shoulders and your knees under your hips. Do the first set of bent-knee glute kickback, then go right into the straight leg kick backs before you switch legs. For both drills, lead the way with your heel and keep your toes pointing downward. Lean forward and keep your hands flat on the floor. Keep your focus on the glutes and hamstrings. Keep your core engaged. Using a bench or flat surface, start in a seated position with both feet flat on the floor and weight evenly distributed across your feet and hips. Extend your left leg parallel to the floor. Using your right side only, push off your right foot to stand. Slowly lower yourself back to the bench without falling. Stand on one leg, keeping that knee slightly bent. Bending at the hip, extending your free leg behind you for balance. Continue folding forward at your hips, so your weight and arms hang below your shoulders. Keep your black flat. The goal is to get your chest parallel to the ground, and then return to the upright position. If you can’t extend to the full range of motion only go as far as you can while keeping a flat back and proper form. Lay flat on the floor, with your legs bent at the knee, your heels as close as you can to your glutes. Raise at the hips by digging through your heels. Raise your hips as high as you can keeping your heels and shoulder blades firmly planted to the ground. Slowly return to starting position.